When it comes to distributing aid to developing countries, few countries give as much compared to their Gross National Income (GNI) as Denmark. Along with Norway, Sweden, Luxembourg and the UK, Denmark is part of an exclusive group of OECD countries that live up to the UN’s goal of giving at least 0.7 percent of their GNI away in aid. According to the latest OECD figures for 2017, Denmark earmarked 0.72 percent of its GNI to development. “We should be proud that we have once again lived up to the UN target in terms of aid,” said the development minister, Ulla Tørnæs. Until last year, Germany was also among the countries to meet the UN target, but it has fallen under the 0.7 percent threshold in 2017 with a rate of 0.66 percent. 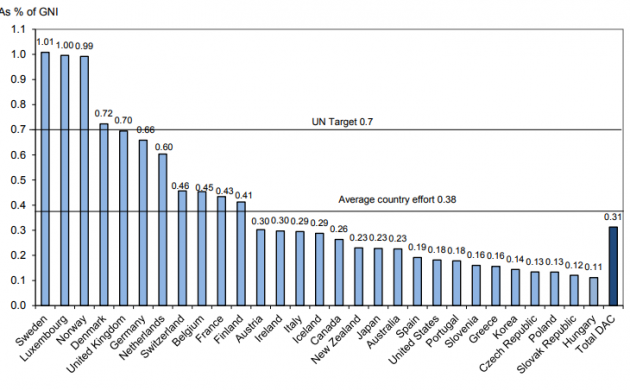 The OECD secretary general, Angel Gurría, stated that while overall aid funds have increased in recent years, there are still far too many donor countries below the 0.7 percent target. “Supporting developing countries with ODA is the fastest route to spreading stability and inclusive growth and it will be vital for developing countries to achieve the Sustainable Development Goals. Donor countries should be using this time of economic expansion to step up their efforts, both increasing their levels of foreign aid and ensuring it goes to the poorest countries,” he said. 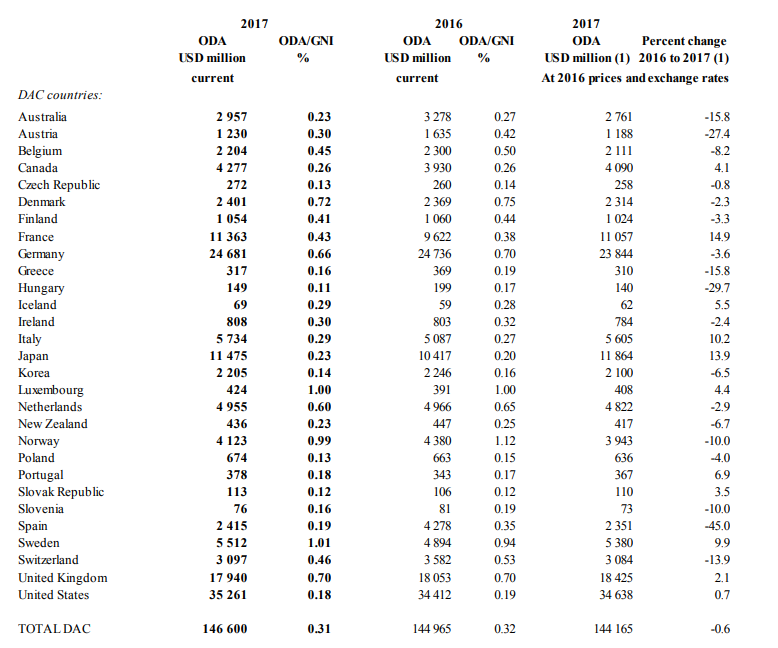 Sweden led the aid trail by giving 1.01 percent of its GNI, followed by Luxembourg (1.00), Norway (0.99), Denmark (0.72) and the UK (0.70). Other OECD notables include Australia (0.23), Canada (0.26), Finland (0.41), the Netherlands (0.60), Switzerland (0.46), Japan (0.23), South Korea (0.14) and the US (0.18). Read more about the OECD figures here.